Edinburgh Castle is a historic fortress which dominates the skyline of the city of Edinburgh. Archaeologists have established human occupation of the rock since at least the Iron Age (2nd century AD), although the nature of the early settlement is unclear. There has been a royal castle on the rock since at least the reign of David I in the 12th century, and the site continued to be a royal residence until 1633. From the 15th century the castle's residential role declined, and by the 17th century it was principally used as military barracks with a large garrison. 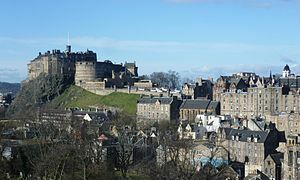 This article uses material from the Wikipedia article "Edinburgh Castle", which is released under the Creative Commons Attribution-Share-Alike 3.0 License.